Ram has launched a new metric-ton pickup slotted for sales in the Middle East market. It’s called the Ram 1200 and its debut took place in Dubai among an audience of fleet buyers, distributors, and regional media members. This mid-size pickup joins the full-size Ram 1500 to round out the brand’s presence in the region. Ram was fairly quiet on the details, but we do know several key points. 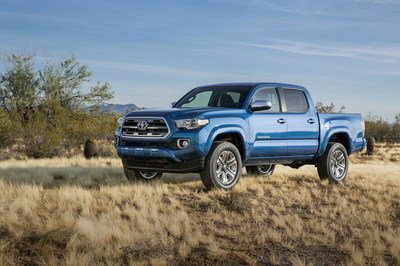 The truck will be offered in three trim level, in regular and crew cab versions, powered a gasoline or turbodiesel option, with the choice of RWD or 4WD, and the option of a manual or automatic transmission. Ram never mentioned, however, the pickup is basically a re-badged Mitsubishi Triton L200. This isn’t the fist badge-engineered L200 we’ve seen come from Fiat Chrysler Automobiles. 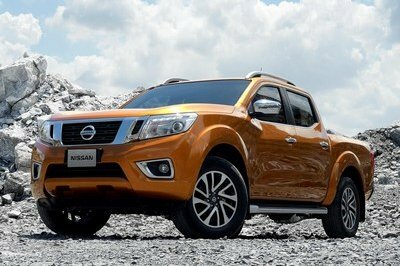 The Fiat Fullback currently on sale in Europe is a direct clone of the Mitsu. Unlike the Ram 1200, the Fullback is aimed at a more domesticated buying audience. The Ram is built for fleet and commercial work. Despite not having the full information, we’d bet big money Ram will never bring the 1200 to the U.S. It simply isn’t built to pass U.S. crash testing and emissions regulations, let alone designed to compete in the increasingly competitive mid-size truck segment. Nevertheless, let’s have a look at the Ram 1200. Continue reading to learn more about the Ram 1200 Truck. Ram Just Debuted A Hellcat-Powered Raptor Killer! What Make a Ram Power Wagon? Speaking of the grille, totally absent is any design cue resembling the crosshair grille Ram typically wears. 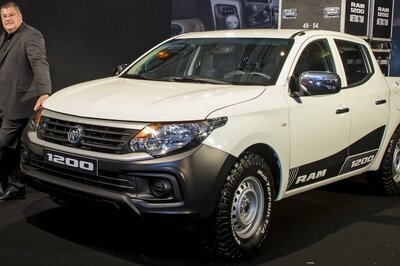 The Ram 1200 might be a badge-engineered version of the Mitsubishi L220, but it does get a somewhat unique front clip. Depending on trim level, the truck either features a black plastic bumper or a color-keyed fascia. Traditional halogen headlights and optional fog lights flank the upper and lower grille sections. Speaking of the grille, totally absent is any design cue resembling the crosshair grille Ram typically wears. Not even the unique grille from the Ram Rebel, a truck that’s also available in the Middle East, is used or styling cues. The truck’s Mitsubishi heritage shines through along the sides of the truck. The roofline and doors both match those of the L200. Apparently there is also an option for a cargo box tie-down rail along the length of the bed wall. It looks sturdy and rather handy for securing cargo. The Ram 1200 also comes with different tire choices. A more street-biased option is countered by meaty BFGoodrich Mud-Terrain T/A KO tires mounted on steel rims. Size wise, the Ram1200 measures 69.8 inches tall, 70.2 inches wide, and has a wheelbase of 118 inches. Its length depends on the cab configuration. Regular cab models measure 206.5 inches long, while the crew cab is 211.4 inches long. Note: Ram 1500 pictured here. Ram has not released a photo of the interior, but we imagine it will be a direct copy of the Mitsubishi L200’s cabin, minus a Ram badge on the steering wheel. That’s not really a bad thing though, as the L200 has a well design layout with what looks like decent materials. At least in the upper trim levels, the L200 offers leather seating, piano-black trim pieces, dual-zone climate controls, a multi-function steering wheel, a driver information screen in the gauge cluster, and a touch-sensitive infotainment system. Crew cab models offers seating for four grown adults, or five in a pinch. We’ll bring you more information as soon as Ram releases it. The Ram 1200 comes with two engine options: a 130-horsepower, 2.4-liter gasoline four-cylinder and a 2.5-liter four-cylinder turbodiesel. The Ram 1200 comes with two engine options: a 130-horsepower, 2.4-liter gasoline four-cylinder and a 2.5-liter four-cylinder turbodiesel making 126 horsepower in its base tune or 134 horses in its high-output tune. Both engines can be had with either a six-speed manual transmission or an optional automatic gearbox. As usual, the truck can be had in RWD or optionally with 4WD. Ram has specified that 4WD versions will come with either a manually operated transfer case or an optional electronically controlled system. The two-speed, part-time system offers 2WD, 4WD high range, and 4WD low range. The Ram is designed to work, so it boasts a payload capacity of 2,568 pounds. That’s impressively more than the U.S.-spec Chevrolet Silverado’s 1,990-pound payload rating. Towing is equally impressive for this size truck. It’s rated to pull thee metric tons, or 6,614 pounds. Ram has not released pricing for the Ram 1200, but we expect it to undercut the Mitsubishi L200 Triton and the Fiat Fullback. Ram’s target market is the fleet and commercial segments, after all. The Hilux has long been the top metric-ton truck. It offers outstanding reliability, competitive payload and towing numbers, and several choices in engine options. 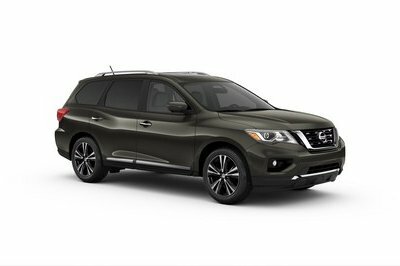 They include a 2.8-liter turbodiesel making 174 horsepower and 331 pound-feet of torque, a 2.4-liter turbodiesel with 160 horses and 295 pound-feet, a 2.7-liter gasoline four-cylinder with 164 horsepower, and the familiar 4.0-liter V-6 making 278 horsepower. A six-speed manual and six-speed automatic are both available. The Hilux is also offered in a wide range of trim options and cab and bed configurations. The truck spans every segment from a base work truck to a leather-lined, four-door personal truck. 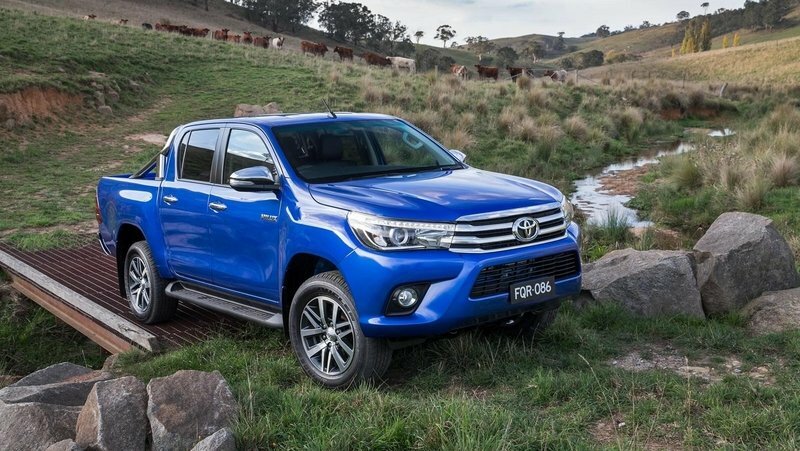 Read more about the Toyota Hilux here. The global Ranger is yet another solid competitor in the metric-ton pickup category. It offers outstanding payload and towing capacities, wrapped in a package roughly the side of a U.S.-spec mid-size truck. 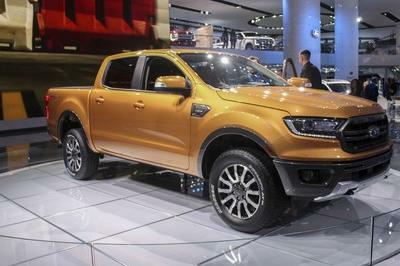 Nevertheless, the Ranger boasts that capabilities that outclass half-ton, and in some cases, one-ton pickups. Like the Hilux, the Ranger can be had in bare-bones work truck trim or a fully loaded, leather-appointed luxury trim. Four engine options give customers plenty of choice. There’s a 2.2-liter four-cylinder turbodiesel with two output ratings, a 3.2-liter five-cylinder turbodiesel, and a 2.5-liter four-cylinder gasoline engine. Both RWD and 4WD are offered, as well as a manual and automatic transmission. 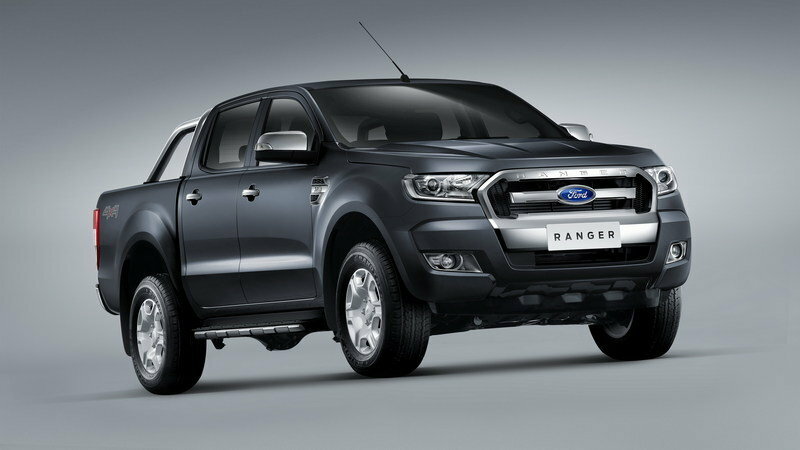 Find out more about the Ford Ranger here. Ram’s move to capture more of the global market is clearly taking shape. The FCA division is boosting its exportation of the Ram 1500 and is now capturing a new market segment with the Ram 1200. Combined, both trucks should help grab a healthy percentage of market share. While we wish Ram had developed the 1200 on its own with in-house manpower, it’s easy to see the business case for collaborating with Mitsubishi. Undoubtedly both automakers stand to benefit from the arrangement. Sadly, the Ram 1200 is far removed from any conversation about Ram building a mid-size truck for the North American market. Its overseas assembly, the Chicken Tax, and stringent regulations on emissions and crash safety prevent a simple importation of the truck. In all honesty, that’s probably a good thing. If Ram wants to compete in the U.S. mid-size truck category, it’s going to have to bring its A-game. Stay tuned as Ram eventually announced more details regarding its new Ram 1200 metric ton pickup. The expansion of the Ram brand outside of North America continues with the introduction of the new Ram 1200, a metric ton pickup truck revealed today in Dubai, UAE, to an exclusive audience of regional media, distributors and key fleet customers. The Ram 1200 joins a highly capable lineup of larger Ram trucks, and its debut gives the brand access to the largest truck segment in the Middle East. “The launch of this metric ton pickup truck is the next step in our expansion of the Ram brand,” said Robert J. Hegbloom, Head of Ram Brand International, FCA US LLC. “This is all part of our plan to develop a solid strategy to expand the Ram Truck brand’s presence in key markets outside of North America. “Our unique brand identity and the breadth of our portfolio will be the keys to unlock the growth of the Ram Truck brand around the world,” said Hegbloom. The Ram 1200 will launch in 2017 in both Single and Double Cab configurations, with three trim levels and a variety of gasoline and diesel engines. All versions of the Ram 1200 have a maximum height of 1,775 mm, are up to 1,785 mm wide and have a wheelbase of 3,000 mm. The length varies depending on the configuration: 5,245 mm (Single Cab) and 5,370 mm (Double Cab). The length of the cargo compartment also varies according to the configuration: 2,265 mm (Single Cab) and 1,520 mm (Double Cab). The payload capacity of the Ram 1200 is up to 1,165 kg, and it can tow up to 3 metric tons. 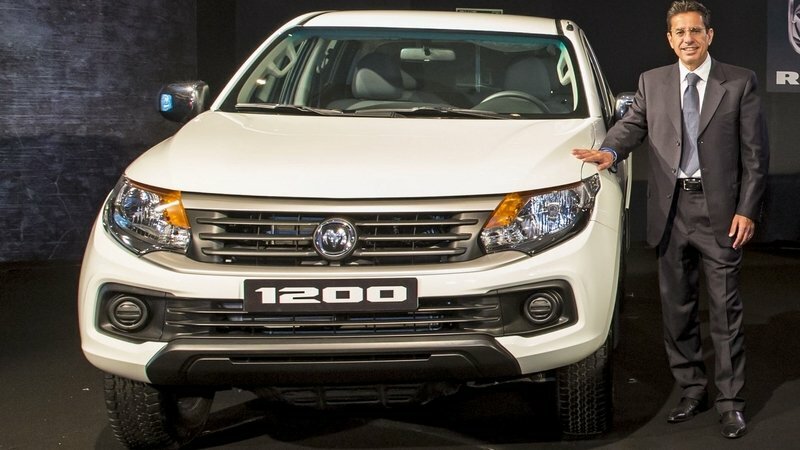 In the Middle East, the Ram 1200 will be available with two engine options: a 2.5-litre diesel with a power output of 94 kW (126 hp) to 100 kW (134 hp) or a 2.4-litre petrol engine that delivers 97 kW (130 hp). A manual gearbox is the standard configuration for both the diesel and petrol engines. An optional automatic transmission will be available. The Ram 1200 will offer a 4x2 version (rear-wheel drive) as well as a 4x4 version (all-wheel drive). The latter will be the one most appreciated by those who, for work reasons, need to reach areas that are off the beaten track or drive on tough off-road trails. All 4x4 versions are equipped with a manual or, on automatic versions, an electronic selector that makes it possible to engage the all-wheel drive in part-time mode. The 4WD Electronic Selector has three driving positions: “2H” (optimal roads) with rear-wheel drive; “4H,” selectable for speeds up to 100 km/hr, distributing traction to all four drive wheels for safer driving on sandy or unpaved tracks; and “4L,” which provides low-range gearing for extreme off-road conditions. The new Ram 1200 was revealed alongside the Ram 1500 Rebel and 1500 Limited, two new additions to the expanding Ram portfolio in the Middle East. The Ram 1500 lineup will expand from eight versions currently to 17 different options next year. This will allow the Ram brand to better focus on the particular needs of customers across the region.